Is there anything more "normal" than a navy sport coat paired with a red necktie? Probably not. Today's necktie is a XMI Platinum with gray and navy striped dancing boxes on the red background. They sorta look like they're dancing. Maybe that's what I'd look like if I was dancing -- square. 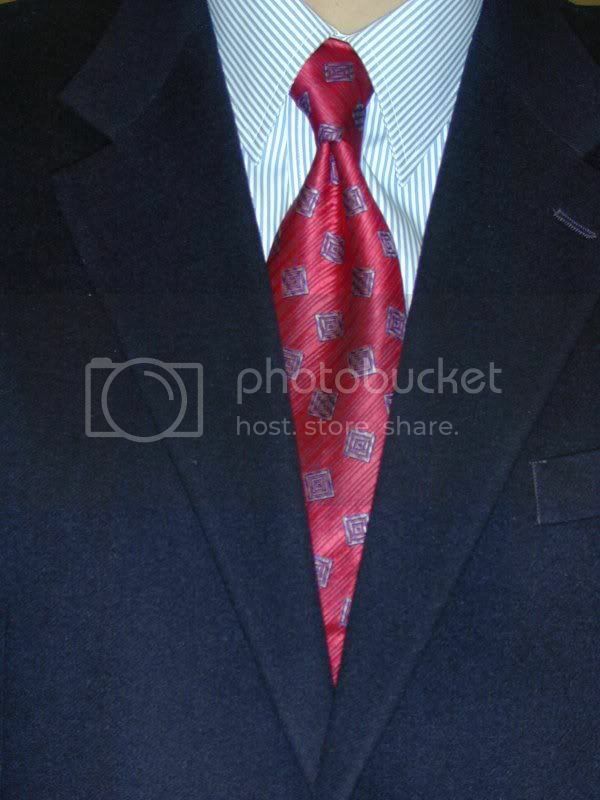 Even in a four-in-hand this tie makes a pretty big knot. The background for today's conglomeration is a blue bengal stripe pinpoint from Lands End. Nice enough shirt but it's a little difficult to get that nifty inverted V from the collar that "They" say is correct. The whole thing is topped off with the navy sport coat, of course.